I’m very pleased to announce that Ray Callaway and I have just had a paper published in Ecology. 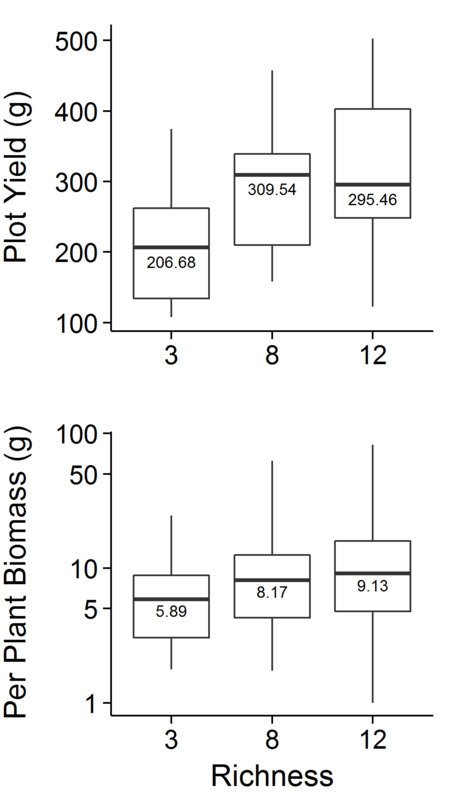 In this paper, we find that genetically diverse populations of bluebunch wheatgrass (Pseudoroegneria spicata) yield about 50% more biomass than populations with low diversity. This diversity-dependent “overyielding” is thought to occur because diverse plant communities function more efficiently than communities with low diversity. There is thought to be less demand for shared resources in diverse communities and less disease (e.g. by soil fungi). As a result, overyielding in species-diverse communities is often associated with changes in soil nutrients, and the yield of low-diversity communities can be “rescued” by killing soil pathogens. However, we find that diversity-dependent overyielding in bluebunch wheatgrass populations was not related to changes in soil nutrients, and was unaffected by fungicide applied to the soil. We conclude that overyielding in genetically diverse populations may not be caused by the same processes that cause overyielding of species diverse communities.